The Polynesian Maori reached New Zealand in about A.D. 800 and settled there. In 1840, their chieftains entered into a compact with Britain, the Treaty of Waitangi, in which they ceded sovereignty to Queen Victoria while retaining territorial rights. In that same year, the British began the first organized colonial settlement. A series of land wars between 1843 and 1872 ended with the defeat of the native peoples. The British colony of New Zealand became an independent dominion in 1907. New Zealand is made up of islands located southeast of the continent of Australia and is home to approximately 4.5 million “Kiwis” – term of endearment used to describe New Zealanders. Most play either Rugby, Cricket – or both. Historically, not many of them have played baseball. Until recently. Baseball was introduced to New Zealand when sports equipment entrepreneur, Albert Spalding, brought an All-Star team and a team from Chicago to play an exhibition game in Wellington. Over the next hundred years, baseball was played only sporadically. In 1989 when the New Zealand Baseball Association was formed., there were approximately 900 players in the country. That number remained steady until 2010, when American Ryan Flynn was appointed Chief Executive Officer of Baseball New Zealand. In the two years that he has been on the job, participation has risen from 900 players to approximately 6000. Flynn hopes that number can reach 100,000 by 2022. “The rise of baseball will be one of sport’s best stories in New Zealand over the next decade,” Flynn says, quoting consecutive 300 per cent annual rises in player numbers, which have swelled to 6000. Because of those gaudy numbers, baseball is the fastest-growing summer sport in New Zealand. Part of the reason for Kiwis taking to the sport so quickly is that most have grown up playing cricket, so throwing and hitting skills have already been developed. Domestically, there are 12 “club” teams divided among five regions. The top seven clubs played for the National Championship in a 3-day tournament in March. The 2011 champions Howick-Pakuranga repeated as champions in 2012. Other teams include Canterbury and Wellington from the south of the country, as well as Auckland based clubs Bayside, North Shore, Orewa, and West City Metro. The New Zealand team is the only nation participating in the World Baseball Classic tournament that is unranked by the IBAF. With that said, the Kiwis have assembled a team that will be competitive, with players hailing from all over the globe. Players need only a parent who is eligible for New Zealand citizenship in order to be able to play for the team. The team has named itself the “Diamond Blacks” – a clever nod to the country’s famous Rugby team, the New Zealand All Blacks. Speaking of which, the famous “All Blacks Haka” isn’t just limited to the Rugby pitch. In New Zealand, it can also be found on the diamond. The first New Zealander to be drafted by an MLB team will be managing the World Baseball Classic squad. Born in New Zealand but raised in the United States, Andy Skeels is one of the winningest managers in professional baseball over the past four years. Skeels has been at the helm of two championship-wininng San Jose Giants ballclubs – the class A affiliate of the San Francisco Giants. Skeels is optimistic about the chances of the Diamond Blacks – and baseball in general – enjoying success in New Zealand. The Diamond Blacks have many connections to the Toronto Blue Jays. The most experienced player on the team is 28-year old Scott Campbell, a member of the Toronto Blue Jays farm system before retiring in 2011 due to a degenerative hip condition. He’s had a cortisone shot and believes he can get through the rigours of a six-game build-up tour of Australia and a four-match tournament in Taiwan. “I know there are going to be some rough days ahead but that’s okay,” he says. Auckland native Daniel Devonshire was drafted by the Toronto Blue Jays earlier this year. The Blue Jays decided to draft the 20-year old first baseman after having seen him play in only one game. Devonshire is expected to bat in the middle of the Diamond Blacks’ order. Former Blue Jays shortstop Chris Woodward has signed on with the Diamond Blacks as a coach. Woodward was previously part of an MLB ambassador trip aimed at getting New Zealanders interested in the sport, and increasing the skill level of New Zealand coaches and players. He has also trained the under-18 team in preparation for international competition. Clearly an underdog as the only non-ranked team in the WBC tournament, New Zealand will be in tough against Thailand, the Philippines and host nation, the 7th ranked team in the world, Taiwan/Chinese Taipei. With that said, baseball is poised for great things in New Zealand and the Diamond Blacks’ upcoming WBC appearance will provide the team with much needed exposure in their home country. With a population of over 4 million and only 6000 registered baseball participants, the sport is very much in its infancy. 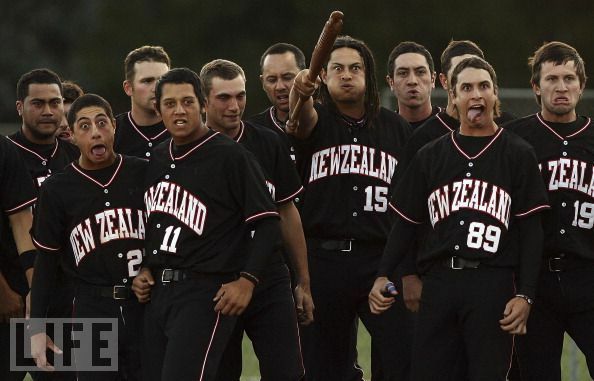 With a 300% annual growth rate, baseball in New Zealand has nearly limitless potential. As a result of their invitation to the WBC, New Zealand Baseball has received $200,000 from MLB – equivalent to their entire annual budget. With additional sponsorships and increased infrastructure, expect to hear much more about Diamond Black baseball in the future. Photo credit: Andrew Cornaga / Photosport.